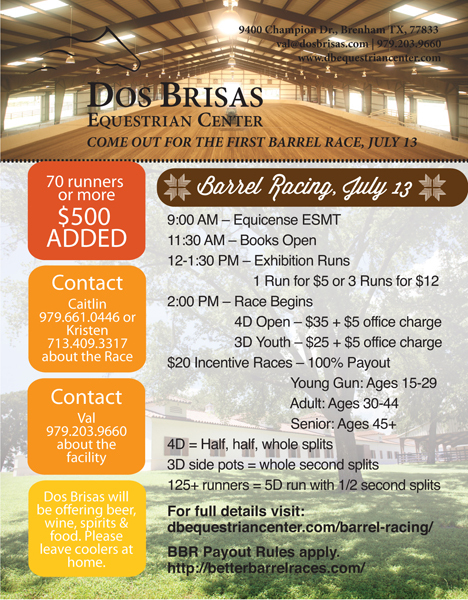 Join the Dos Brisas Equestrian Center for it’s first Barrel Race! 2:00 PM – Race Begins. 4D open – $35 + $5 office charge. 3D Youth – $25 + $5 office charge. 4D = Half, half, whole splits. 3D side pots = whole second splits. 125+ runners = 5D run with 1/2 second splits. Engraved Bronc Halters will be awarded to division champions in Open and Youth. An “Arena Record Holder” buckle will be awarded to 1D Champion! The Inn at Dos Brisas will be offering beer, wine, spirits and concessions. Please leave your coolers at home to protect the facility’s TABC license. There will be two canopy tents offering $2.00 beers and $8.00 brown bag lunches. Guests are welcome to dine at The Inn’s Restaurants but we do ask you please make reservations.